A review of Jonathan Auxier's Peter Nimble and His Fantastic Eyes written by Joe Bissex. 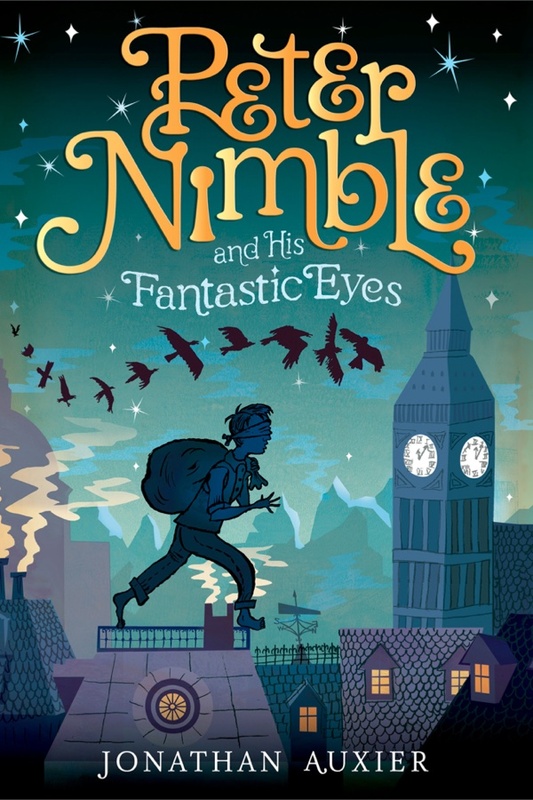 Peter Nimble and His Fantastic Eyes is the story of a blind orphan boy who, for the sake of survival, becomes the best pickpocket in the city. Of course, that is before he falls in with the mind-reading Haberdasher, the cat-horse-knight errant Sir Tode, and the unkindness of Ravens who keep watch over the prisoners in the vast sandy reaches of the Just Deserts. And yes, there is a Princess, and there is… but you must read it for yourself to dig up the other treasures. This delightful book reads like a fairy tale written by J. M. Barrie and Charles Dickens, with some collaborative input from Homer, Jonathan Swift, and Rudyard Kipling. Auxier’s writing is flavored with a zest for words, and a childlike sense of awe for the old stories. His derivations from and nods to Peter Pan, Oliver Twist, Gulliver’s Travels, the Just So Stories, and The Odyssey, are unapologetically gleeful. His snickering imitations do not, however, descend to cynicism or mockery, and indeed the main point of the story is that real innocence triumphs. The fairy tale tropes and traditions are all here: the wise old counsellor giving a strange gift and stranger advice, a long lost heir moving from rags to riches, the evil power-hungry relative, the enormous monsters that must be conquered. The story teaches the prudence of not judging a person by outward appearance or surface behaviors. Peter discovers that apparently harsh people might be very loyal and loving, and apparently helpful people might have very selfish motivations. The story teaches fidelity to friends, and how a random act of kindness to a dogfish in need might prove the saving grace in one’s battle against dragons. While Auxier loves the old stories, he just as clearly loves a fresh and joyful perspective. One funny example is at the end of the story when Peter becomes a sea captain with a hook. An ironic twist. (Sorry, couldn’t resist.) For a more substantial example, although there are some mildly violent action sequences, Auxier stays away from the gloom and doom gruesomeness that characterize so many of the stories of, for example, the Brothers Grimm. No chopped fingers and barrels of nails here, though everyone does indeed get their just deserts. For another example, Auxier is as interested in the parent/child relationship as J.M. Barrie (there is a clear Wendy mothering the lost boys moment), but believes that a good relationship is possible, where Barrie saw escape and pretending as the only real option. I mentioned above that the main point of the story is the triumph of innocence. But this innocence is not ingénue ignorance, and the triumph is not only over malice, but also naiveté. Conflating naiveté and innocence is, I believe, an easy mistake to make, but in the world of Peter Nimble, naiveté is as immature as malice. Our protagonists are innocent because they have the purity of children concurrent with the uncanny ability of children to see and speak the truth, however much the adults might wish to turn a blind eye. Not to give anything away, the group of adults who take the blind eye approach are all parents. While this at first led me to think that the story might be dismissive of parents as always clueless, absent, or disconnected, I discovered something very different. This story highlights the dignity of children and parents. A crucial moment comes when the outcome of the day depends on the mother and children listening to each other. This emphasizes the importance of mutual respect between children and parents, and the importance of loving family relationships in general. Over, under, around and through these ideas and perspectives, the book exults in clever words, high adventure, and the joy of discovery. A truly fantastic read. What does Peter learn along his adventures that he didn’t know before? Who do you think are the most loyal characters in the story? Who do you think respects other characters the most? Shall we read it again? Joe lives in Rockville with his dear family, a mountain of books, two mountains of board games, one or two stray spider crickets (where are the Daleks when you need them? ), and a collection of 150 shot glasses. He can rave endlessly about the awesomeness of The Odyssey and The Tempest, much to the annual dismay of a bunch of unsuspecting sophomores. An avid fan of all things theatrical, Joe directs the Omnibus Players of The Heights School, as well as teaching Acting and Production Design. He received a B.A. from Thomas Aquinas College, an M.A. from University of Dallas, and is working on a Masters in Theatre Education at Catholic University of America. In his spare time he practices the fine art of taking 30-second naps. Omnia Omnibus!